After you have tried paddle boarding, perhaps on a friend’s SUP board or one you’ve rented from a shop, you will probably want to consider buying your own. It’s important to know how each feature of the board and how it is adjusted can change how the board works on the water. Let’s look at questions you need to answer and the features you need so you will know what SUP to buy. What are you going to use the SUP for? Will others be using the SUP? What Are You Going To Use Your SUP board For? If you are going to be splashing in the waves, and crashing in the ocean then a shorter board that can turn very fast is what you will want. However, if you are going to be staying in one place on stable water to do yoga positions, your board needs to be very wide in order to stay stable while you move into those various positions. Long boards that are also very narrow are built specifically for speed and can do that in any type of water conditions. Some boards have room for cargo, are long, and can be as wide or narrow as the rider wants. These are usually referred to as cruising SUP boards and are best used on calm, flat water. So the investment in your first SUP should be in the one that will get the most use on the water. If you spend most of your time at the ocean, then you know you aren’t going to spend a lot of time on calm, flat water, so a longer board won’t be necessary. So take your surroundings, plus your preferences, into consideration. Video: Beginners guide to choosing a paddle board. Are Others Going To Be Using The SUP Board? If you aren’t going to be the only person using the board, you will have to take everyone’s preferences into consideration and not just your own. If you are an advanced paddle boarder but there are people in the family that are not, then it may not be wise to get one that would be best used by an advanced rider. Some shops have events where they can demonstrate the SUP boards for people (their features and benefits), and sometimes even let others ride them to let them try them out themselves. This is a great way for people who don’t have much experience with different boards check them out all at one event. Another way is to go to a rental shop and rent each major type to get a feel for the different features and which ones in your family like in common. Then you can get one you all agree on. Here is a review of some of the best SUPs on the market. Your height is important to the width of the board because if you are shorter in stature and you have too wide of a board, then you will be reaching too far out to the side to get your paddle into the water and that will make you work a lot harder and also increases your risk of injury to your shoulders and your back. Every paddle board is designed for a specific weight range. It is easier for new paddlers if you stick to boards that are in the lighter range of what is recommended for your weight. Width is very important when choosing a board. A narrow board will be faster but a wider board will be more stable. If a newer paddler chooses a SUP board that is too narrow they may be scared off the sport altogether. Even an inch or two in width of the paddleboard may not make a noticeable difference in the speed for the boarder but it can make all the difference in your stability, and when you are more stable you can stay balanced on the board and paddle better. Typically, the length of a board affects how quickly it turns and how fast it can go. For example, a long paddleboard can cruise along a lot faster, but is not meant to turn fast. The shorter paddleboards you see people paddling through the ocean waves are meant to slow you up so you can think a second as that next wave comes at you and turns quick so you can react to it. As with anything that has a three-dimensional shape, it’s volume is going to be determined by the amount of area it takes up in the 3D world. This means that how thick, how wide, and how long the board is all determine the volume of the paddleboard. The paddleboard’s volume is just one factor that should be taken into consideration when picking out a board. The weight and height of the boarder, as well as the length and width of the board are also factors. If you are going to be paddling on calm, flat waters then the single, center-spaced, large fin is a typical setup. The more fins a board has, the more “surf-oriented” it is, and a board can have up to four, or even five, fins. If you were to go with three – a large center one and a smaller one on each side, called side bites – then your board would be equally able to handle calm waters and some amount of surf (at least as far as the fins came into play). If you typically paddleboard in the shallows, where your fins can get snapped quite easily, there are fins made out of nylon that are more flexible. Those may be better suited to your needs and save you some money. The area of foam that feels “grippy” on the top of your paddleboard is the part that most people want to pick out for themselves so a lot of shops don’t put them on until a customer has chosen what they wanted. If a boarder likes to stay in one spot on the board they may not want a large pad, but if they like to move around, or if they are moving into different yoga stances on the board, then they will need a different shape and type of pad. Most shops can apply these for you in a way that won’t void your board or grip’s warranty. If you prefer not to have a pad at all, you can choose to wax your paddleboard just as you would a surfboard. Now that you know how to buy one, I just want to give you some options on the types of boards out there. Here is a quick rundown on the types of boards. 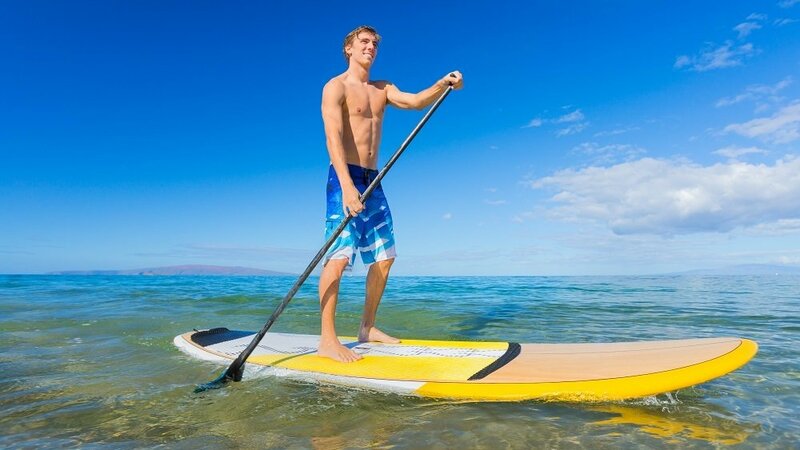 All around paddle boards are for all around use and tend to be longer, wider and thicker so they are more stable. This type of board is meant for and all day paddle on flat water. These are great beginner stand up paddle boards. Inflatable SUPs were made for the person who doesn’t want to deal with storing or transporting a standard fiberglass SUP. While they have some downsides like not being as rigid and mainly for flat-water paddling. Here are some inflatable paddle boards for you to consider. SUPs for surfing tend to be shorter and narrower especially at the nose and tail of the board. A surf paddleboard are meant for quick turns and high performance. They are not meant for a leisurely paddle. As you might guess a yoga style board is going to be wider and longer to give the rider stability so they can do their poses. They also usually have a soft top and places to attach bands and a PFD. With more paddle boarding racing popping up recently, the racing style SUP has become very popular. This type of SUP is narrower, longer with very narrow front and a long fin for tracking. When you decide that SUP boarding is for you and you are into it, it’s a large investment, but once you have your board and your gear, you are pretty much set. So get the board you will use the most the first time. You will want others and the collection will grow, but you will always keep and use that first board so make the investment right. There are almost as many type of paddle as there are SUPs. Modern technology has been applied and there are now paddles made from carbon fiber, fiberglass and of course aluminum. As with most things, lighter is better to reduce fatigue while paddling, especially for extended times. When starting out, if your SUP came with a paddle, its probably sufficient. As you get better and paddle for longer periods, you can upgrade to a carbon fiber. Here are some reviews of beginner to expert SUP paddles. The last consideration is safety related, wearing a PFD of flotation device. Your going to fall off the SUP at some point, especially when starting out. Even if you are a strong swimmer, its still a good idea to wear a life jacket, even if you are a strong swimmer. Getting caught in a current or riptide will tire out even the strongest swimmer. If you plan on transporting your paddle board and its not an inflatable model that can be packed up into a backpack, your best option is a SUP roof rack. A rack allows you to easily and safely transport your SUP. Even if you don’t have rails on the top of your car, there are racks that mount without them! While transporting your paddle board the best way to protect your board from dings and scratches is a board bag. A storage bag will also protect your board from damaging UV rays plus you can keep you paddle and personal items altogether. If you bought an inflatable SUP, congratulations! However you will quickly discover pumping up the paddle board can get tiresome. Even though the hand pumps that come with the iSUPS work well, it can take 10-15 minutes of work. Why get tired before even getting out on the water? With an SUP electric pump you plug into your car accessory outlet or 12v battery, not only can you inflate it quicker it saves you the effort! I hope this guide was helpful for finding a paddle board (SUP) to fit your needs. If you want to comment or recommendation, please use my contact form to get in touch. Serial Entrepreneur traversing many of nature's best terrain to get a better view of what our nature has to teach us and usually specializes in health conscious digital media. For the past seventeen years Keith has consulted for numerous industries including many Fortune 500 firms down to small family run companies. He brings his experience and a well-rounded lifestyle on an as-needed basis with a passion for saving the planet, cause someone has to do the job.